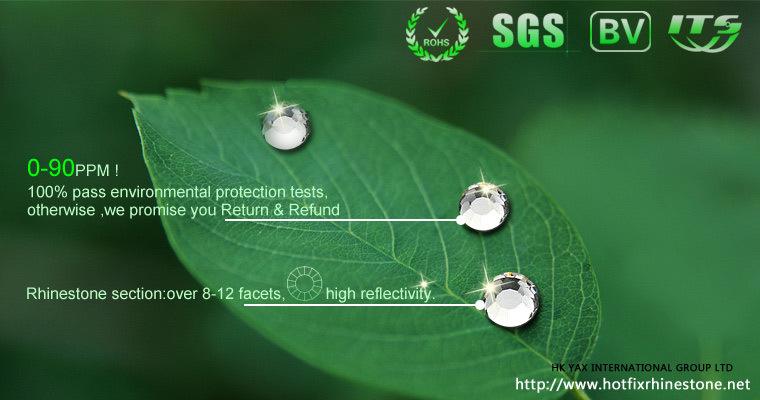 What is the characteristics on surface of lead free rhinestone? 1. Crystal surface refractive is good, high purity, no bubbles. As a result of lead free rhinestone is a special method of smelting artificial crystal, did not join the lead as a smelting material, so in the light refraction will not show black luminescence, purity brightness and translucent are better. In the past, the smelting of artificial crystals was due to the addition of heavy metal lead to smelting, otherwise the light refraction would be very poor. This is a technical problem! Swainstone Adhere of research for many years in this field, and finally obtain a perfect breakthrough in this area which is the industry's pioneer leader. 2. Glue: A. Lead free rhinestone primer with gray green glue (domestic manufacturers to YAX lead free glue as the base), this can be used to identify by the naked eye. B. The glue is quite strong, the storage time generally can be reach several years without degumming than the normal rhinestone more than 5 times. C. glue wash, after iron, you can use the high temperature washing more than 100 times do not fall off. 4.Low defective rate: Lead free rhinestone defective rate is very low, Normally say,It is the most cost-effective in all rhinestones. GZ Yax is doing better in this area . But it must be pointed out that rhinestone is really Eco-friendly, it need measured by the instrument rather than juge from the appearance.